Bates Agricultural Machinery. | Launceston Then! the founder of this engineering company, an engineer and former director of the company: “T.W. Bate & Dunheved Ironworks”, and “W.H. Jones & Dunheved Ironworks,” copies of both are held in the Launceston Public Library – C/338 768 17630, and C/338 761763 respectively. Walter Bate was a blacksmith at Boyton village for about fifty years, where he was born 22/04/1818, and died in 1888. Walter and his wife, Mary Ann, produced eight children, five of them are buried in Boyton Churchyard, beside himself and his wife. Son John and his brother, Thomas Walter, worked for their father at Boyton, then John emigrated to Canada, becoming involved with a carriage works there. In 1882, Thomas Walter Bate joined an engineering company in Leeds to gain experience in agricultural engineering. 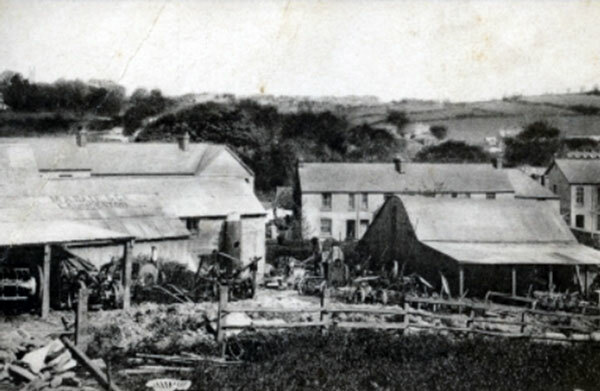 He returned to Boyton for a time, but in 1888 he moved to Stowford, Lewdown, where he manufactured farm implements – a four-horse mill on a ground frame was one item of manufacture, a survival of which was lately on show at the Wendron Forge, Cornwall, complete with cast-iron name plate – “T. W. Bate, Stowford.” He also produced sheep racks and other products. 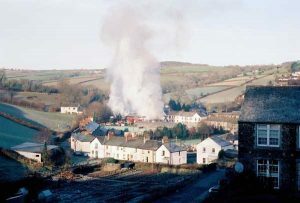 After four years at Stowford, T. W. Bate moved to Launceston in 1892, renting an old works which had been ironworks owned by Mr W. H. Reed, who had manufactured implements and fireplaces there. [Cultivators, rakes, ploughs and possibly sold chaff-cutters and mills from there.] 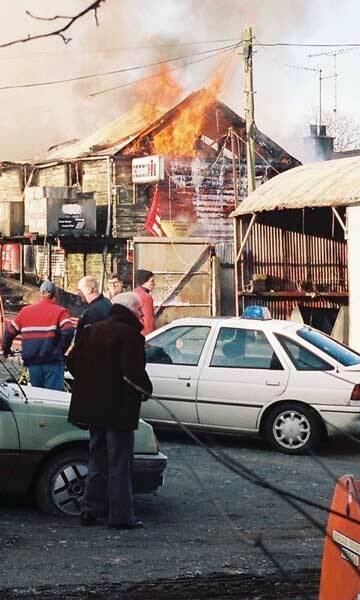 Mr Reed had previously had premises in Madford Lane, Launceston. 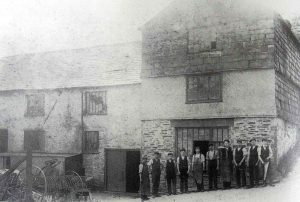 The building now bought by Mr Bate had at one time been a sawmill, and then a bone crushing plant, and was still using a water wheel for power. Mr Bate rented the building for two years when it was put up for sale in 1894, and he made his bid and took possession, with enough Land for further building as required. Mr Walter Bate had married Miss Fulford of Boyton, and two children were born at Boyton, Herbert Thomas, in 1885, and Emma Jane in 1887, the latter being the mother of the author of the quoted books. Two further children were born at Stowford, Walter John in 1889, and Albert William in 1891. 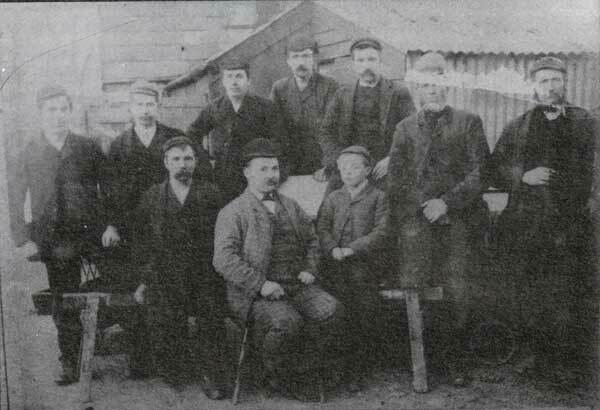 The staff of T. W. Bate from around 1902. At Launceston, the Bates lived first on the Walk, near the Church, but around 1900, Mr Bate had some houses built near his works, and moved into Number One, Tredydon Road, where he lived until his death. During the first few years at the “Dunheved Iron Works,” the old undershot water-wheel failed to produce sufficient power for the requirements of the machinery so a mid-shot wheel was fitted, and then supplemented by a steam engine; later still, a Tangye engine was fitted. Mr Bate had a foundry installed, requiring even more power for the large fans, and he then fitted a Blackstone 10 h.p. engine in 1903 (similar to the 9 h.p. left), then, in 1907, he further increased the power with a 17 h.p. Blackstone stationary engine. Several machines were installed over the next few years, and several new buildings were erected to cover them; four forges, grindstones, band saws, drills, bowing machines, lathes and screwcutters, plus many more specialist machines were put to produce his chisellers, broadcast seed drills, single row mangold and turnip drills, horse hoes [single and triple row], banking ploughs, expanding horse rakes, the patent rick-cover [a roof on pulleys for hay and corn stacks], sheep racks, cattle cribs, tine harrows, barn threshing machines, reed-combers, chaff separators, and the horse-mills to drive them. He also provided machinery from other makers. Mr Bate tried to cater for all farming needs and visited the shows all over Britain. 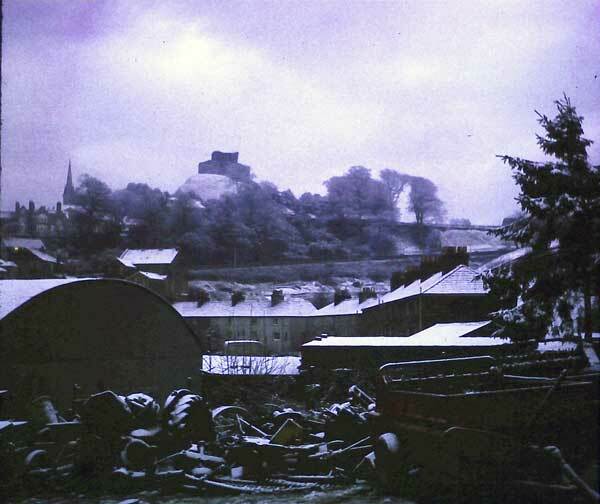 In his books, Mr Jones names many of the manufacturers and their products, including the ploughs and tractors supplied by America and Australia, and of the improvements and additions carried out by the Dunheved Ironworks to cater for local farming requirements. Mr Jones, as an engineer with the firm, was trained at Dursley to install, repair, and maintain Petter engines, and spent time in other workshops, too, all the time attaining greater skills and knowledge. To put together enough capital to build up the business and the works, Mr Bate had, in 1900, formed a Private Company of the business, naming it “M. A. Bate & Co.”, the M. A. being his wife’s initials; Mary Ann. 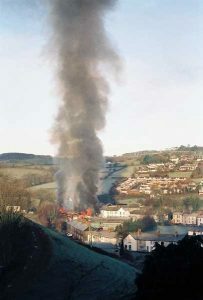 Looking down on the Dunheved Iron Works in Tredydan Road, Launceston. Photo courtesy of Ian Rivers. Around 1964, another local company, ‘Messrs. 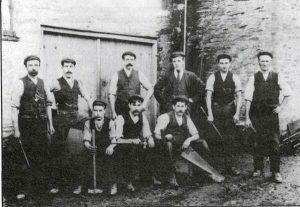 Hamblys of Whitstone’, who were the agents for David Brown, held talks with M. A. Bate & Co. and they amalgamated their businesses in 1964, Mr Jones carrying on as a director of the new company. 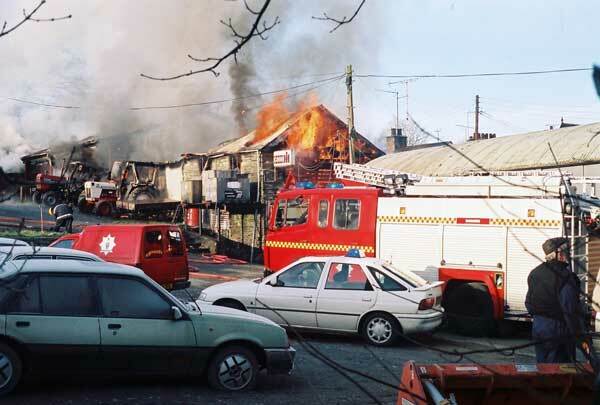 At some later date, probably after the retirement of Mr Jones, the company became known as “Hamblys of Whitstone,” with their main works at the old Dunheved Ironworks until, on 21st January, 1998, a disastrous fire (see pictures below) broke out, destroying practically everything at the depot (see below). 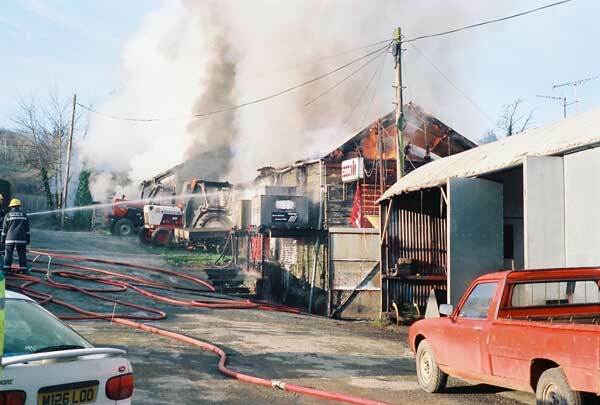 Not to be outdone, Hambleys set up business at Scarne, Hurdon Road, in an old ‘bus depot (formerly a haulage company workshops and depot), until moving to the Pennygillam Industrial Estate, beside the A-30 dual carriageway. 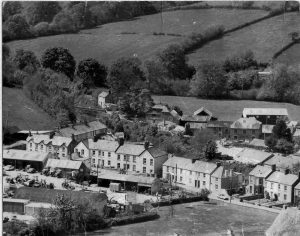 The Introduction to the first book was written by a local historian and collector, Miss Joan Rendell: “The name of Bate has been synonymous with farm machinery in north and east Cornwall, and west Devon for many years. As a product, Bate machinery was known for quality and fine workmanship, and the story of the family connected with the firm is a fascinating one, proving that determination and a will to succeed, coupled with meticulous attention to detail in craftsmanship, points the way to success. On his ‘retirement’ in 1976, Mr Jones set himself up to make ornamental ironwork and founded a very successful second business. In his books Mr Jones has many illustrations and drawings of machinery, with dates and times for some. Staff of T.W. Bate c.1905. Left to right standing Arthur Callard, unknown, unknown, H.T. Bate, unknown, Sam Box. Seated: Dicky Harris, Jimmy Giffard, Joe Walter.